BackHero Reviews - Is it a Scam or Legit? Those looking for back-pain relief as well as posture correction may find what they need in BackHero, a posture corrector that claims to relieve pain and straighten your back while you stand or sit. BackHero Review – Experience Back Pain Relief? BackHero is a posture corrector that uses a combination of a neoprene brace and shoulder straps along with 12 magnets to help you sit up straighter and relieve back pain. What makes this posture device unique is that it claims to help adjust your posture as well as reduce the amount of pain you feel in your lower back. The posture garment is one of the many products offered by Megadeals Ltd., a company based in Europe. Some of the other items they sell include small A/C units, diffusers, speakers, drones and many more things. In this review, we’ll cover how the BackHero works, talk about the mechanisms behind the alleged benefits and then discuss what doctors say about posture correction devices like this one. We’ll also talk about the pricing and return policy of the BackHero, as well as other similar products that get good reviews from customers. This posture device has two main areas of support: a belt that goes around your waist and supports your lower back, and a harness that goes up your back and around your shoulders. These two parts of the device – it's all one piece – work together to line up your back and your shoulders. At the same time, a series of 12 magnets included in the part of the device work to influence your nerves in a way that purportedly will relieve your pain. Six of those magnets lined the back of the waistband and six more magnets are sewn into the part of the garment that goes up the middle of your back toward your shoulders. The important takeaway here is that those who have waists bigger than 40 inches won’t be able to use this device comfortably. The BackHero website provides a video as well as multiple photos of how the brace can help you better your posture. We wanted to see how these claims held up against professional scrutiny, so we reached out to get advice from chiropractors. Dr. Allen Conrad, owner of Montgomery County (PA) Chiropractic Center, said that you’ll most likely see your best results from chiropractic adjustment and posture exercises as opposed to posture correctors that contain magnets. “Products that attempt to straighten you up with braces or magnets do not fix your posture and are not recommended. The reason your posture is off is from your spine and its associated muscles have been misaligned, and a brace will not fix that,” Conrad told us. Chiropractor William Charschan runs New Jersey-based Charschan Chiropractic and Sports Injury Associates. Charschan went on to explain that back pain isn’t always due to posture issues. “While it seems everyone has a solution, the truth is, your body mechanics and how you have developed your patterns of movement and adapted over your many years of walking have a lot to do with why people suffer back pain,” he told us. In the end, said Dr. Cheryl Lee-Pow, correcting posture isn’t about bracing your back; exercise is. Wearing a brace like BackHero can help you with circulation but back exercises are the key to building the muscles that help you sit and stand up straight. Mayo Clinic notes that examples of good core-muscle exercises include planks, crunches and various body-weight exercises that don’t require any special equipment. At the time of publishing, a single BackHero sold for $49.99. Buying more of them brings better per-item discounts. Three cost $79.99 and five cost $109.99, meaning that the per-item price in a five-pack is around $22 instead of the $49.99 you’d pay for one brace. An important thing to note is that BackHero advertises their posture correctors at 50% off. This discount is already calculated into the price. So, if it says one brace is $49.99, it’s $49.99 and not $24.99. Each posture corrector comes with free shipping. Returning your BackHero has to take place within 30 days of receiving it in the mail. The main catch to their return policy is that you’ll only get a refund if the posture corrector is unused. If you’ve used it, then your options are limited to exchanges. Whichever the case, you’ll run into one major snag that may make returns and refunds too expensive: shipping. You have to cover the cost of sending the posture corrector back. Because the company behind BackHero is based in Europe, you’ll have to ship to Estonia, which will cost you at least $24 when shipping from the United States in a box with no sides longer than 12 inches. Basically, shipping a return will cost you half of what you paid to use the BackHero. With this in mind, we think it’s best if you’re 100 percent certain you will keep your posture corrector. Trying it with the mentality that you’ll return it doesn’t make a lot of financial sense considering the international shipping costs. Posture correctors are an interesting genre because you have more traditional options that resemble back braces but you also have small devices that you attach to your back that buzz when you start to lean forward and, it is assumed, fall into bad posture. Based on our comparison of the BackHero to these various top-ranked items on Amazon, we noticed that none of the three posture correctors/trainers in the above list come with magnets. Now, as one chiropractor pointed out, there is no definitive evidence that magnets can relieve pain. However, if you believe they do, then BackHero is the better choice. Aside from that, we believe that the Araoamas and Soarrucy posture correctors offer the same function as the BackHero but at a lower price. The Upright PRO, on the other hand, forces you to keep your back straight rather than relying on a brace. According to the chiropractors with whom we spoke, this could be a better choice simply because it requires you to sit up straight via your own muscles. This means, in theory, those muscles will strengthen over time whereas a posture brace tends to weaken the muscles intended to give you good posture. Based on our research of this product and email conversations we had with chiropractors across the country, we believe this posture corrector’s greatest strength is that it could help have better posture while you’re wearing it. However, as chiropractor Dr. Cheryl Lee-Pow pointed out, you’ll need to add core-muscle workouts to your daily routine if you truly want to strengthen your back and create good posture. We see the main downside to this product being its price tag. 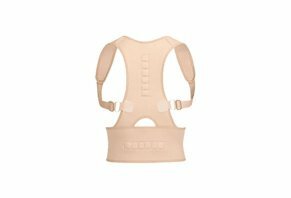 There are dozens of other back braces on Amazon that rate well among customers and cost half as much or more than the BackHero. If this review has piqued your interest and you want to learn more, our guide to posture correctors will help you understand how they work and in which situations they may work best or worst. Write a Review for BackHero!